I sometimes work with children, and as a result of that I sometimes come into contact with children’s movies. By and large, this doesn’t bother me. I’m not so dead inside that I can’t bear to be amused, and most kid’s movies are pretty decent. But pretty decent is different from actually good, and having now read this article, it occurs to me that maybe there’s more going on in Turbo than I originally thought. It’s deeply weird. And the further you go into the story, the more you see that it’s weird all the way down. 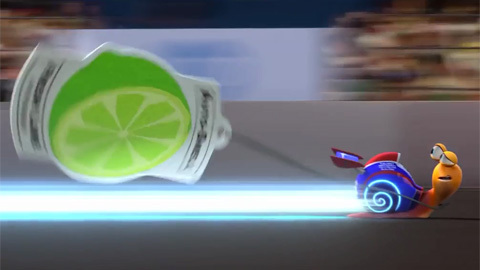 Our hero is Turbo (Ryan Reynolds) the titular snail who has always wanted to go fast. He loves watching tapes of old races, and he constantly complains about how slow it is at his job, working in a vegetable garden. Turbo’s brother, Chet (Paul Giamatti) is always on him to get his act together and accept his lot in life. Clearly, since we know how kid’s movies work, Chet is wrong and Turbo is going to prove by the end of the movie that snails can be fast. Because that is an important message that needs to be communicated to our kids. Clearly. Late one night, while ogling all the cars on the freeway, Turbo falls and somehow gets bounced over until he’s sucked up into the engine of a street racing car, like one of the ones you’d see in Fast and Furious. The car goes really fast, and Turbo gets infused with nitrous oxide, or something like that. Whatever it is that makes cars go really fast. And then Turbo has superpowers. Car superpowers. I don’t know. It’s weird. 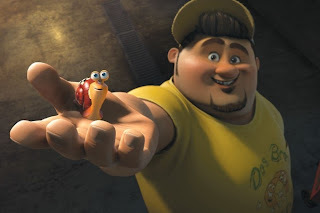 Chet wants Turbo to hide his powers, because they’re weird, but Turbo decides that this is a sign that he should go make his living as a racing snail. Chet tells him he’s crazy. Because he is. Anyway, through a wacky and seemingly random set of circumstances, Turbo and Chet are fired from their jobs, and somehow end up in downtown LA where they’re caught by a taco truck employee who brings them to a (gasp!) snail racing competition. Obviously Turbo wins and they’re all super jealous of how fast he can go. 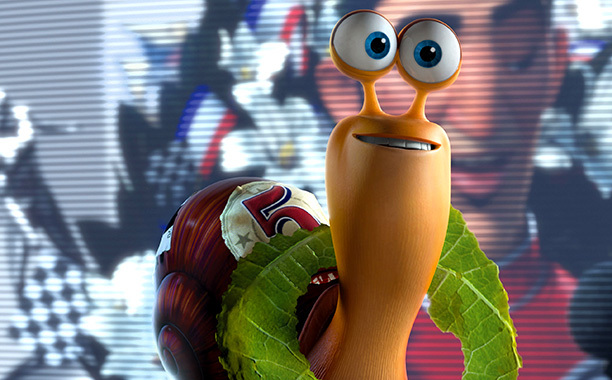 The other snails, voiced by several people, but most notably Samuel L. Jackson, are all crazy weirdos who love to go fast. Turbo feels right at home, but naysaying Chet continues to be a wet blanket. The story gets even more convoluted from here, but basically the human who found Turbo wants to use him to get more business for the taco stand, and Turbo convinces him to enter him in the Indy 500. They gather up the entrance fee and they’re off. And then he races in the Indy 500 after a really silly interval of “Let the snail race!” and a court hearing and all that nonsense, and then his powers go out at a crucial moment but he wins anyway because you should always believe in yourself and Chet comes around and barf. Okay, let’s start with the really obvious problem with this story. More obvious than the whole thing about how it’s another nonsensical tale of how believing really hard and wanting something more than anything and being a nice person is a substitute for hard work and being very good at what you intend to do. That’s annoying. And also probably deeply damaging for little kids to hear. Kids? Take it from your Auntie Deborah, whatever you want to do, you better really freaking want to do it, because it’s going to take time, hard work, and a lot of boring repetitions of stuff you feel like you already know how to do before you’re even close to good enough to compete with the people who are okay at it. I mean it. You are going to work for over ten thousand hours at this, if you can work that much and that hard, and when you’re done, you won’t be the best. You won’t even be the second best. You’ll be good. And then you’ll have to keep working to figure out how to be great. That’s the frustration and the beauty of doing something you love. Anything you love. Nothing gets handed to you, and you have to work for it. But you do it because it’s what you love. Honestly, though, damaging as the “follow your heart, if you can dream it you can be it” slogan is for kids, I think the more damaging message here is that your dream is more valuable than your support for the people around you. Because that is patently untrue. In the story, Turbo openly denigrates the plant where he works, and where he’s presumably grown up, where everyone he knows lives, and where his brother makes a perfectly happy life. He says it’s boring and miserable. And that may very well be true. For everyone else, though, working on that plant is a very good thing. They get food to eat, a place to live, a relatively safe environment. The snails like it there. But Turbo doesn’t, and through his own selfish actions, he not only performs badly in his job, constantly trying to dodge work or avoid contributing, but he actually destroys the plan. He puts his community out of work, and, worst of all, he refuses to feel remorse for this. I get it. He doesn’t like living there, working with tomatoes, or having to “go slow”. But they do. They liked working there. And he, through his own carelessness, has now debilitated his community. And he doesn’t see that maybe it’s wrong. It feels heretical to say this, since we as a Western culture so very much love to laud the individual, but sometimes we need to stop being selfish. Sometimes we have to back off and think, sure, this is what I want to do. But is this what would benefit my community? Am I caring for the lives of others as well as my own? Kid’s movies tend to act like this question is mean. Like asking if you should consider the hopes and dreams of other people, or even their basic livelihood above your own happiness is tantamount to slave labor. But it isn’t. It’s actually really freeing. You know who lives longer, reports more happiness and meaning in their lives, and has a considerably lower rate of chronic disease and depression? People in community. And if you want to be in community, you might have to make some sacrifices. But here’s the thing. Everyone else is making those sacrifices too. And they stop feeling like sacrifices eventually. They start to feel different. Like you’re building something. Together. Now I’m not saying to never ever follow your dream. That wouldn’t be accurate either. What I’m saying is more nuanced. I’m saying that you should look at your dream and then look at your community. Work hard for what you want, but help others do the same. Look at your life and figure out what will actually bring you meaning. And remember that the people in your life are the ones who actually matter. Not what you do, but who you do it with. You forgot the part where one brother STEALS the entry fee, but the victim doesn't care because they win! Otherwise, thank you for articulating everything that upset me so well. One of the most popular pastimes is watching solar movies. Most people love to watch movies.